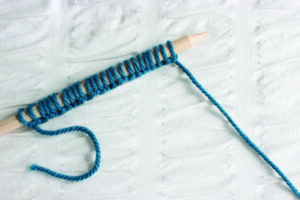 Make a slipknot with the yarn and place it on one of the knitting needles, leaving a 6” tail. 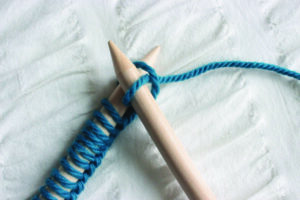 Using the working yarn (the strand attached to the ball of yarn), make a loop and slide it next to the slipknot on the knitting needle. Continue to do this until you have a total of 25 loops on the needle, including the slipknot. 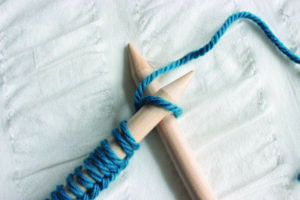 The working yarn should be at the pointed end of the needle, hanging from the last loop. The slipknot should be nearest the other end of the needle. 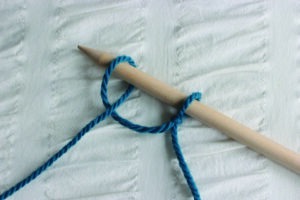 Hold the needle with the cast on stitches in your left hand with the point facing up. 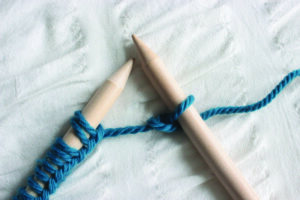 Holding the other knitting needle in your right hand, place the tip of the right needle into the front of the first loop on the left needle. 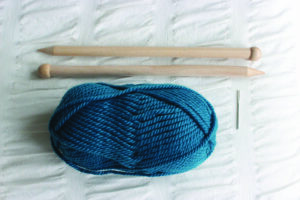 Wrap the working yarn once, front to back, around the tip of the right needle. 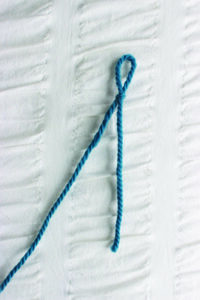 Use the tip of the right needle to pull this working yarn loop through the cast on loop and toward you. 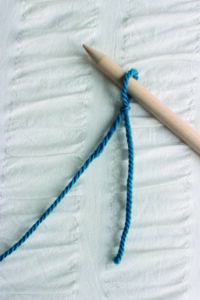 Once this new loop is securely on the right needle, allow the cast on the loop to slide off the tip of the left needle. 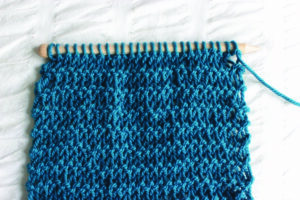 It will now hang below the new stitch you made on the right needle. Continue to do this for each cast on stitch. 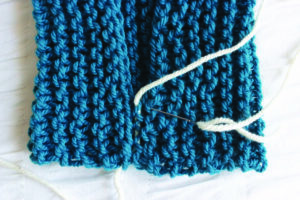 When you reach the end of the row, the right needle should have all 25 stitches, and the left needle should be empty. Switch the right needle to your left hand and the left needle to your right hand. 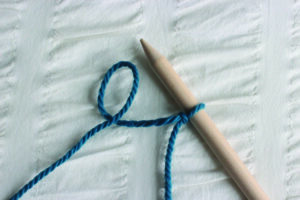 You will always be knitting from the needle held in your left hand onto the needle held in your right hand. 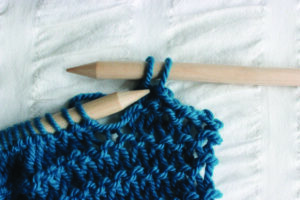 Once the needles have changed hands, continue to follow steps 1-4 to complete another row. 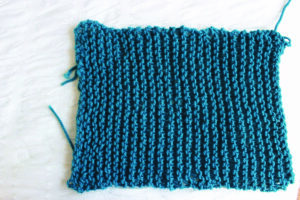 Continue to do the same for each row until the scarf measures 24” or as long as you choose. 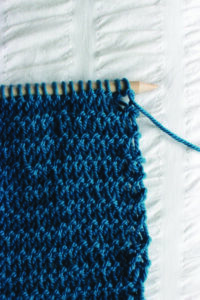 At the beginning of a new row, knit the first two stitches. 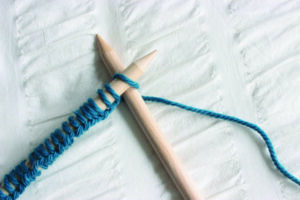 Take the first stitch on the right-hand needle (the stitch farthest from the tip) and, using the tip of the left-hand needle, pull this stitch over the second stitch and off the tip of the right needle. 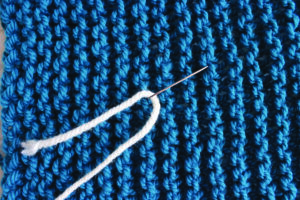 There should now be only one stitch on the right needle. 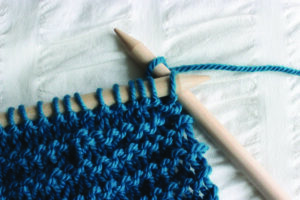 Knit the next stitch on the left needle. 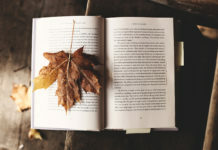 Repeat step 2. 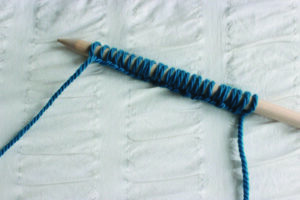 Continue in this manner until all stitches have been bound off. 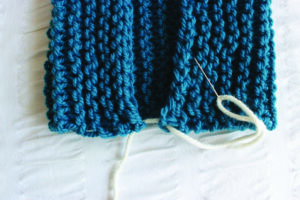 There will be one remaining stitch on the right needle when you reach the end of the row. Cut the working yarn and leave a 24” tail. 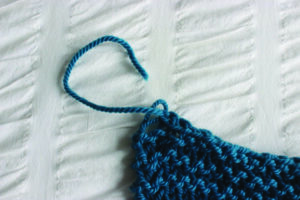 Pull the working yarn through the loop of the last stitch on the right needle. You have now bound off all 25 stitches. 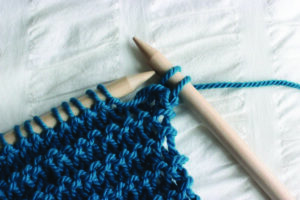 Turn the scarf sideways, so the cast on and bind off edges are the left and right sides. 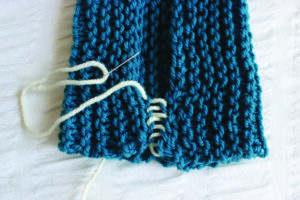 Sew the cast on and bind off edges together. 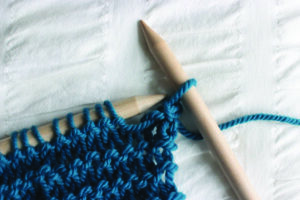 Weave any loose ends into the fabric of the scarf so they do not show. Your scarf is now a circle! Fold the top down to reveal a chic, double-layered circle scarf that fits perfectly under coat collars and keeps the wind off your neck. 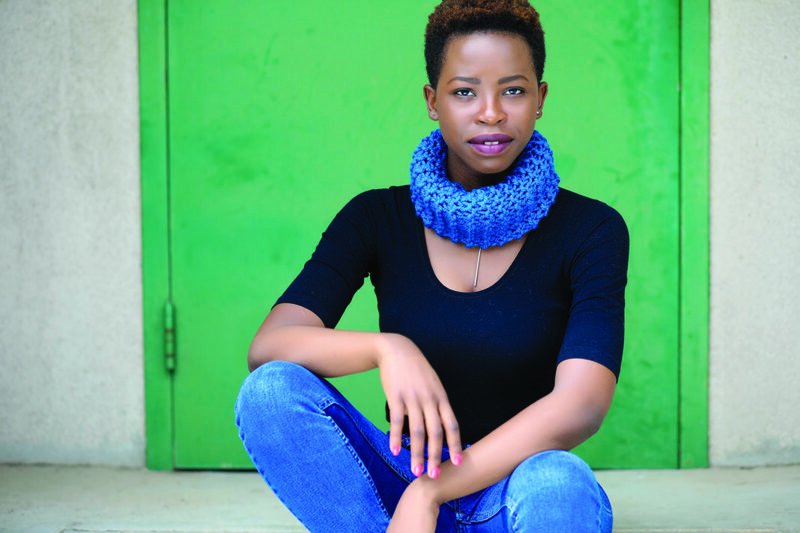 Once you have the hang of it, this scarf knits up incredibly quickly and is perfect for last-minute gifts.